19 years of the Madden curse – what is it, and will it strike Tom Brady? EA's football sim has taken down countless NFL stars. Has it been banished for the new season? 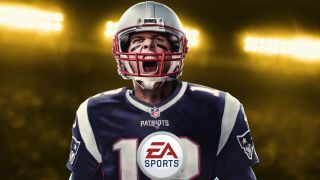 Love or hate New England Patriots' quarterback Tom Brady, you had to enjoy his Madden 18 cover unveiling earlier in the year – where the five-time Super Bowl winner openly issued a 'come at me, bro' style acknowledgement of the supposed Madden curse. were shattered when Hearst's foot locked in the Georgia Dome turf. It would be two years, and a miraculous recovery from avascular necrosis, before he'd play again. The thunder-thighed St Louis Rams legend had rushed for 1,300 yards four seasons in a row before clinching a deal to be the frontman for Madden NFL 03. He'd temporarily avoid the already-dreaded curse – albeit with a dip in stats – in the year of his likeness being on the cover, but like Lost's smoke monster (which was also definitely real, right?) couldn't outrun it for ever. In 2004, an ankle injury caused Faulk to miss five games, and in 2006 he chose to hang up his cleats and take a new role in the NFL Access TV studio after undergoing reconstructive knee surgery. Then-Atlanta quarterback Vick's reward for many years of being considered the ultimate online cheat player was an appearance on the packaging of Madden NFL 2004. This time round, the game's hoodoo smote its target in record time, with the once-impervious Falcon fracturing an ankle in a meaningless pre-season game before the campaign proper had even begun. Vick would play just five more times that year, before losing form and, eventually, all credibility after being jailed in April 2007 for his involvement in an illegal interstate dog-fighting ring. NFC East Division Champion in 2001. NFC East Division Champion in 2002. NFC East Division Champion in 2003. NFC East Division Champion in 2004. Madden cover choice in 2005 and – inevitably – there that glorious run ended. A pre-season fallout with top receiver Terrell Owens proved ominously prescient, as a sore thumb, sports hernia and, finally, serious groin injury put paid to McNabb's season by mid-November. Worse was to follow exactly a year later, when the Eagles star QB tore the anterior cruciate ligament and meniscus in his right knee while jumping out of bounds. Unlike most players on his list, he'd taste glory again with a Pro Bowl appearance in 2009, before moving to the Redskins in 2010 (pictured). The number three pick in 2006's NFL draft and rookie of the year in his debut season, Tennessee's brightest hope of the noughties would be considered a lost cause by the time the tens rolled into view. Many pinpoint his appearance on the cover of Madden NFL 08 as the turning point. Young was benched for the first pre-season game after breaking a team rule, struggled with a recurring quad injury late in that same campaign, and lost his starter's job at the next season's outset thanks to a knee knack. He's not featured in the NFL since a brief Eagles stint in 2011, and was waived by the CFL's Saskatchewan Roughriders earlier this year. After a miraculous 1,177-yard, 13-touchdown 2010 season in Cleveland, Browns fans campaigned long and loud for the Arkansas graduate to win the following summer's public Madden 12 cover vote. They would quickly regret their wish. A bout of strep throat and two separate hamstring injuries disrupted his ensuing campaign and led to him departing Ohio at the season's end. Brief stints with Kansas City, Tampa Bay and New York were no less underwhelming, and he played his final NFL game in August 2014 – just three years after that fateful cover appearance. Long-term PGA Golf frontman Tiger Woods evaded the infamous curse for years, until an astonishing domestic incident in 2009 where he crashed his car into a fire hydrant yards from his own home. Then, in 2015, Northern Irishman McIlroy took over the mantle of EA's club-swinging posterboy and was swiftly struck down in the most bizarre of circumstances. Midway through a football kickabout with friends mere days before the game's 14 July release date, he ruptured a ligament in his left ankle. The resulting lay-off caused McIlroy to be the first defending champion to miss the sport's illustrious Open since 1954. 'Gronk' is unquestionably the NFL's best tight end of the last five years, and – if he can stay healthy – may well end up in Hall Of Fame contention once he hangs 'em up. But his 2016 season was a write-off; and it came on the back of his Madden cover appearance. The big guy missed the Pats' opening two games with a hamstring injury, then – after finally recovering some form mid-season – suffered a pulmonary contusion against Seattle in week 11. The final blow came a week later, as he was struck down with a back injury in a game versus the Jets, and underwent surgery for a herniated disc. Astonishingly, New England went on to win the Super Bowl without him. Madden 18, with Tom Brady on the cover, is released on 25 August. For more, check out 9 things you have to know about Longshot story mode – direct from its creator.